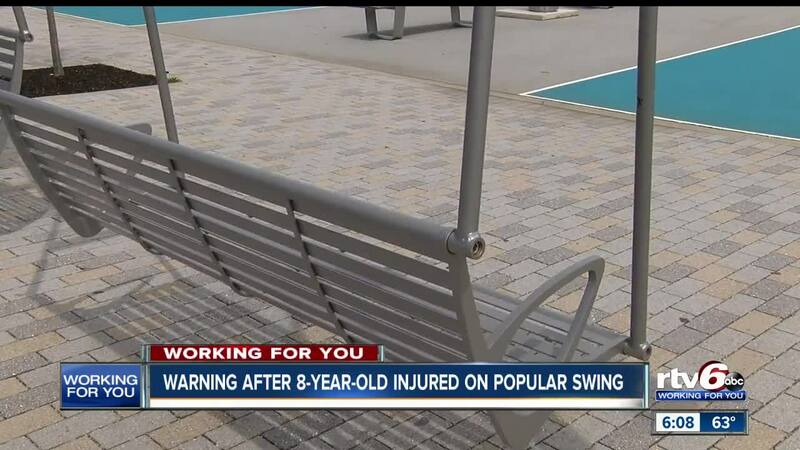 Warning after 8-year-old injured on popular swing. INDIANAPOLIS — A mother says her daughter was pushing from behind the swings at Tarkington Park when her daughter was pulled underneath and severely injured. Now, the mother hopes her story serves as a warning to parents. The swings at Tarkington Park are a family favorite for Patricia Carter and her daughter Elaina. Just like her kids always do, Carter says, the kids were taking turns pushing each other. "So when she took a turn, she was pushing the swing forward, and she went with it and lost her footing somehow. And as it came back, it just came back on top of her," Carter said. "I think it went a little too high, it was... it's really far and then it was almost watching where you can fall off - when I was pushing. And I went back, and my legs started hurting. I was on the ground, and I couldn't move." Elaina had to be rushed to the hospital and spent four hours in surgery. Elaina's leg is now broken; the ball joint that goes into her hip completely broke off. Her hip is currently being held together by plates and screws. Carter's daughter now uses a walker at home but will have to be in a wheelchair for six to eight weeks. Indy Parks is now working with staff at Tarkington Park to understand better what happened and address any areas that may require a safety review. Although, Indy Parks says they were not made aware of the incident until this report. "It's just sad; I don't want it to happen to anyone else," Carter said. "Indy Parks is committed to ensuring that our parks and park spaces are safe for children and their families. Although we were not made aware of an incident at Tarkington Park, we are now working with our staff to better understand what happened and to address any areas that may require a safety review."